Laid Off Loser: Laid Off Loser Album of the Day: "Songs of Love and Hate"
Laid Off Loser Album of the Day: "Songs of Love and Hate"
Draw the shades, down some cough syrup and lie motionless on the floor. Songs of Love and Hate is dark music for dark times, a hunchbacked man's soundtrack to woeful meditation and willful solitary confinement. 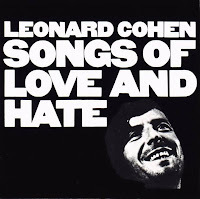 Just two albums earlier, on Songs of Leonard Cohen, Suzanne was feeding you tea and oranges that came all the way from China, but Golden Boy has lost his famous golden touch. "Hey, Prince, you need a shave." That's right, it's come to this, yes it's come to this. Wasn't it a long way down?